The M21 mortar halftrack fires 3 phosphorus rounds that devastate all infantry caught in it with a very slim chance of escaping as it not only kills but has a slow effect and reduces all infantry to health of 1. Compare this to the Wehr mortar half track that has only a single flame round ability that does nowhere near the amount of damage the phosphorous round does , takes over 5 flame rounds to do anything to a building and has no slow effect and costs nearly twice as much 45 munitions . Something is very wrong here . The M21 needs a cost increase for phosphorus or damage tweaks 25 munitions is frankly a joke. Nevertheless, I would like to change for KV-8 and KV-2. 1) Why does the KV-2 inspire infantry if there is a Commissioner? 2) Why does the KV-8 inspire the infantry if there is a Medical tent? I think to replace 1 veteran status in this way. It enables the KV-2 to fire through any obstacle for 25 seconds. Cost 75 ammo. 2) KV-8 Replace the ability of the Inspire to "Scorched earth". It enables the KV-8 to release the entire combustible mixture on infantry, tanks and buildings. Effective: + 25% firing range, +20 damage on infantry, Confident fire on the building, and Medium and Heavy tanks withstand 0 review when in contact with fire. Cost 50-80 ammo. 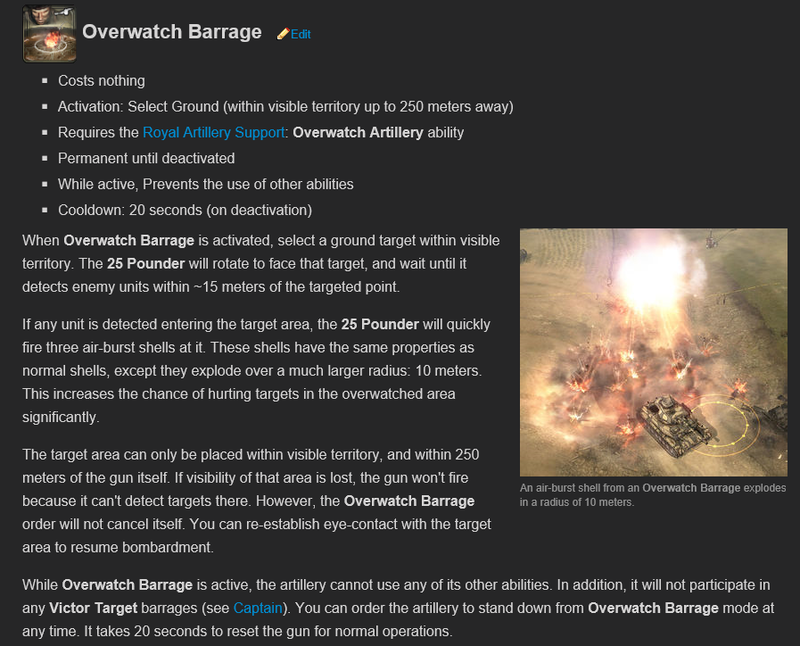 I think "Anti Tank Overwatch" is a good idea, but too expensive. Why? 1) It is expensive! for 200 ammo. The new AT Overwatch seems like a good idea, but definately need improving. tightrope did a video on the changes and it shows how the barrage can't track even a reversing King Tiger with damaged engine. the shells do little damage but have good penetration, so its more of a deterrant nd area denial tool which is fine. the tracking definately needs to be looked at. Here's an updated overview of all my feedback on the OKW commanders. Partly based on the usage in the tourney. Updated for 1.8. Once again I'd like to thank the team for a great job so far and for the community approach. General consensus: good commander overal. Fixes to the abilities have come a long way and the addition of the 221/223 is very interesting. Still I think it needs some more minor adjustments to become a truly viable commander. I think the cost should be slightly adjusted to 200MP/20FU, in comparison to OST's 222 (200MP/30FU). 223 upgrade can be increased to 120MP/10FU to keep total cost for the mobile cache the same. Partly based on its limited use during the tourney, I think it currently comes onto the field a bit late for what it can do (as 221). I would propose to test it with the requirement moved down to having an SWS truck built, rather than an HQ set up. This should put its deployment time down by 2-3 minutes and give it a bit of shock value. Makes players choose between teching or fighting power. If this is too early for USF/UKF to deal with it, armor could be lowered and the 223 upgrade could act like armored skirts (historically earlier models of 221 had less armor). The ability to engage aircraft would be nice. Could be considered for vet4 to replace the durability bonus that isn't incredibly useful. Good overhaul, ability is really useful now and definitely worth the trade with pintle mount. While the current implementation of the PC's Artillery Barrage is very useful, it does devastating damage against tanks because it is so concentrated. See https://www.coh2.org/topic/82569/commander-revamp-patch-bug-list/post/699991. Would propose to spread out shells a bit more. Please consider removing light cover collision from the rocket. This unit is already very micro heavy and clumsy to use, and after going through all the trouble of manually reloading and planning the next attack it's very annoying when the rocket detonates prematurely just because there was a small bush or fence in the way. If this isn't possible, decrease the random scatter a bit so avoiding cover with the shot is actually in the player's control. I think the limit of 1 shared with King Tiger is something that wasn't needed. These units serve completely different roles and do not supplement each other like the Command Panther would. I would like to see this limit removed. General consensus: this doctrine has had an identity crisis, I hope the return of Sector Assault fixes things a bit but I remain sceptical. I still think the Jagdtiger would fit really well in this doctrine and would be much better than the LeFH 18. Good thing to have merged these with Goliath to open up another slot. Doesn't need any changes. One suggestion: allow infantry to plant the flag flares (for free?) on friendly flags that are not capped by the Overwatch player. This would encourage more teamwork in team games and make this doctrinal ability more useful there. Having to do it manually with squads would be a significant micro / combat power tax. Awesome change to 1 CP, they will be much more easy to integrate into build orders. Please take a look at their veterancy requirements. They seem incredibly high, it takes ages to get them even past vet 2. Could be lowered by 25-33% I think. There is somewhat of an issue with their weapon slots as the Scoped Gewehr 43 doesn't count as one. They can pick up 2 dropped weapons besides the Gew43 and it doesn't switch over to the last two models if they have picked up weaons. LeFH 18 is an odd adition to the doctrine. It doesn't make it particularily attractive to choose. If one wants LeFH 18, Defensive Doctrine is generally the better choice. Personally, I would like to see this slot replaced by the Jagdtiger. It seemed a very popular idea among the community. Giving Overwatch the Jagdtiger would give the doctrine the significant boost it needs with a high power unit at the end. Would synergise well with JLI and Early Warning for sight. This would also open up a chance to tweak the Jagdtiger a bit to make it less powerful but more practical to use. Firepower and mobility down to Elefant levels, removing the (quite ridiculous frankly) engine upgrade. Cost down a bit. This ability is still pretty random. I don't really know what can be done about it to make it better. I do like how it opens up a forced choice where to spend munitions and it counteracts the Goliaths. But I think to become a real choice it needs to be a bit more consistant. Some ideas to improve it: add a second strafe plane. Maybe add spotting to the strafe planes. Turn the random bombing into a pattern (like Air Supremacy) although this would make it much less unique. I don't know, is it a final version of update. If it is not, pls pay attention to this ability, it is overdominant for it's price, especially on 2v2 close maps. 1. Make it possible to call only on friendly territory, so this ability is harder to use as offensive. 2. Reduce prive to 180, CPs to 10 and make it work like "Sector artyllery" with 1/2 more sectors connected. 3. Make this ability "chaotic neutral" so it will attack any vehicle which comes to target zone. P.S. Does really stalin on avatar is OK for forum rules? Whether or not the current AT overwatch is useful, In my opinion the fewer the "auto-target in a radius abilties" the better. I mean things like scas, p47s, il2 loiter, etc and now this. Directional air support, or targeted artillery barrages tend to be more in the interest of fair play/skill. Just use the IL-2 AT bomb strafe from Tank Hunter Tactics. Solid ability, and gives the player more responsibility with whether it actually hits or misses. The AT overwatch ability is not so good. Bad... Actually... An engine damaged KT can outrun the arty strikes let alone a properly functional tank. A buffed B4 would probably work in this commander. Give it the sturmtiger treatment of reduced OHK but increased far aoe. Drop damage to like 300 and tighten up scatter. Would take 3 direct hits to kill a tank meaning quite the investment to alpha strike a tank but enough damage to contribute or even turn a battle if it hits a tank. Improve direct fire to like.... Actually work (maybe a skill shot targeted ability like concrete piercing on the isu.... But immobile) so that it actually has Something at vet 1. The sentiment was great but the ability is not. The tracking is too slow for AT and making it faster could make it OP... Arty cover but with kills instead of stun lock death. Brit's 17-pounder emplacement (non-doctrinal) should have its health brought to the same levels of Pak43s (doctrinal). On top of the heath, with their brace ability, they take insane amount of damage and live through. Whereas, Pak43s don't even have brace, gets instant killed to one IL-2 bombing run. the ability to smack tanks from beyond threat is just so good. Pak has 400hp, P17 has 900hp, though P17 target size is large so vulnerable to arty & very easy to be hit. Beside Pak is cheap and posible to build 2 of them. Most important, most non-doc Allied tank T34 SU85 Sherman Jack Crom Firefly can only take 2 shot from Pak. While Axis has Panther, Brum, King able to take more than 2 shot. The Pak itself doesnt strong but the ability to shoot through everything make it strong. Use Pak in an Urban map is auto win if Allies doesnt pick Arti commander. Ost Pak & Brit P17 is fair I can say, but Pak in Okw heavy foritify is totally unstoppable. I'm curious if the uproar of Stormtroopers being changed so drastically has blown over and is set in stone now or is there a chance of it not being implemented? > the ability to smack tanks from beyond threat is just so good. Yup. The 43 is much better than the 17 lber IMO. The shooting through everything is pretty much the only reason, but it's a big one. I think Brit players would trade brace for that any day of the week. This is great revamp. I like everything. Especially commisar, 5 men Grens and new Stormtroopers. Great job by people who do research on topic and make such great changes selected from 99.9% of garbage ballance ideas. Bug: Pretty sure tanks turret can be jammed in some circonstances. I think the bug comes from prioritize vehicule when it doesn't disable properly. The only one i could recreate was switching canon and select prioritize vehicule at the same time on a KV8 w shortcuts. At this point when you unprioritize the turret doesn't fire on infantry anymore only at vehicules. Regarding the commissar, I feel like it should have more utility. The best quality of the squad is healing, but I'd like more useful combat abilities. Propaganda arty is good, but the other 2 have problems. They are underwhelming, and it's hard to say if using them is even helpful. In almost all situations it won't be, especially since there is going to be a weakness, you can only use 1 of the 2 abilities, and only target one squad with it. It's like temporarily giving a unit a passive ability, and that's not going to change the outcome of any engagements that matter. One squad won't make the difference in those. So what do I propose? I am not sure, but perhaps something more active, it should have a direct effect. Perhaps breaking a squads suppressed state, and giving them a bit of temporary resistance to suppression. I don't know, that's also situational. Also, I hope you can fix merging into the squad. It is a significant drawback not being able to merge into it, and I would rather discard the medic model if that's what causing the issue. That model is only for flavor and aesthetic if I understood correctly anyway. I really like the JLI CP1 change. But please take a look at their veterancy requirements, they are too high right now. Veterancy requirements will be lowered in the final notes. There will be some minor changes, but by and large, the mod will be released as presented in the updated patch notes post. Panzer 4 infantry support tank (use the Command panzer model) is anti infantry tank which fire sherman style HE shells and is incapable of dealing to armoured vehicles. Aesthetic note: use Partisan bodies with Volk heads. Veteran Pioneer Leader (60 munitions): Sturmpioneers gain an additional model and panzerfausts disallows "combat package"
All should be mutually exclusive since weapon racks are not discriminate.